Today, it's been two years I'm stuck in the NM queue. I've registered on oct 24, 2005, because Sam Hocevar told me that it could last a little, so if I was interested I should register early. I wondered for a long time if I should resign on this two years birthday, but I dropped this eventuality. 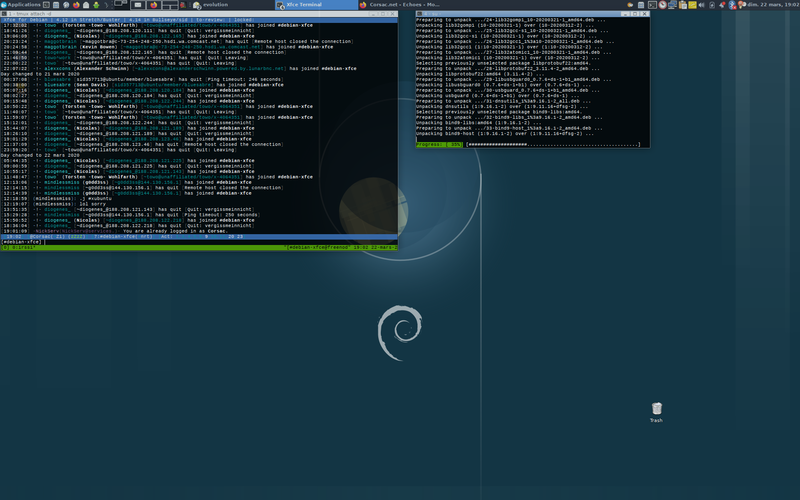 I still want to be a Debian Developer, and if I resign I don't think I'll really want to still work on Xfce packages. But on the other hand I wouldn't really like to use an Xfce not packaged by me (no offense, but I guess I'd still want to hack on it) and I don't think I would be able to be on another distro. So I'm still there, sitting in NM queue, waiting for the next step. The only required step to be accepted as a Debian Developer is to have its gpg key added to the debian keyring (then an account is created on debian boxes, there's a -private subscription etc.). This is done by a team, called DAM, "Debian Accounts Managers". Because at one time they had a lot of work, they could not examine each candidate and decide if he was a potential good Debian Developer, so people imagined the NM Process: some volunteers would help them asking questions to candidates, then write a report, so DAM would only have to read it and decide if it was ok or not to create an account. I've already passed this step. I am "DAM Approved". One could imagine that, if the Debian *Accounts* Managers reviewed and approved my application, the account creation should follow. But no, the next step (according to NM pages) is "DAM creates account or rejects application". The problem here is that there is no "DAM Team", responsible for Debian accounts, but various people which are not really equivalent in this team. This is really a problem in Debian, where teams aren't really a "team". Not every team I guess, but in some cases one can trust a team to do a job. Debian is a volunteer organisation, so people think nobody can be forced to do a job if he doesn't have time to it. I'm fine with that, real life can be really time-consuming sometime. But my opinion is that teams may have to be forced to do their job. If nobody in the team has time, fine, it means somebody should join the team. But the team itself shouldn't fail, and this should be the only thing visible from outside: the "team", and the team actions. There are some proposition about this on lists at the moment, but I don't really know how it'll end. It's not easy doing social stuff, there's a lot of people involved, with many different views. But sometimes the consensus is *not* findable, and sometimes, somebody has to decide. That's why why need team leaders, and that's the project leader role. I guess people are quite opposed to have a "strong" leader in a volunteer organization, and I don't have concrete proposals but I really thing team management is not really perfect and a lot of people (users and developers) suffer from that (not only NM applicants, I mean) and from "elephants". As I said, I have no good solution, nor even concrete proposals (except "sometimes we need a leader to make decisions") but I really think there are things Debian (as a project) needs to improve.